It is a while since I have cleaned the laundry thoroughly and it was beginning to show. The general view of the room looks OK but I was starting to feel that things were just being shoved in the cupboards. 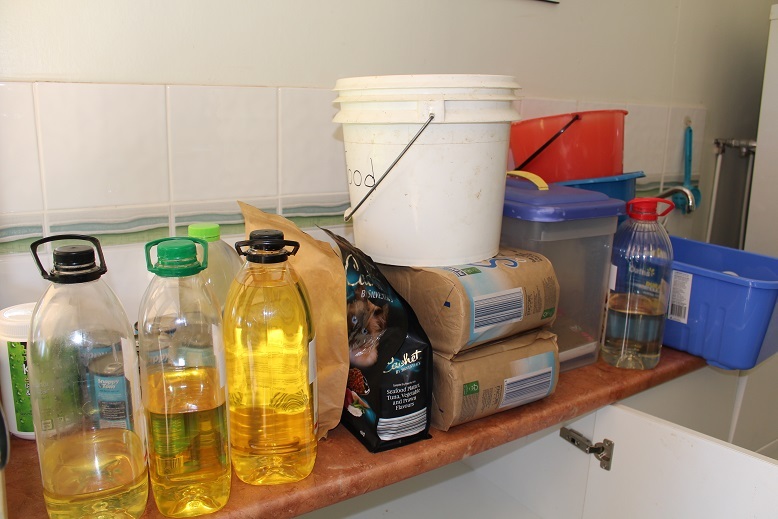 I was finally prompted into action after we went to the Kin Kin markets yesterday to stock up on more laundry liquid and pre-soak/stain remover that are made locally by Felix at Kin Kin Naturals. I have 2 storage areas in this room. One is the cupboards under the bench. 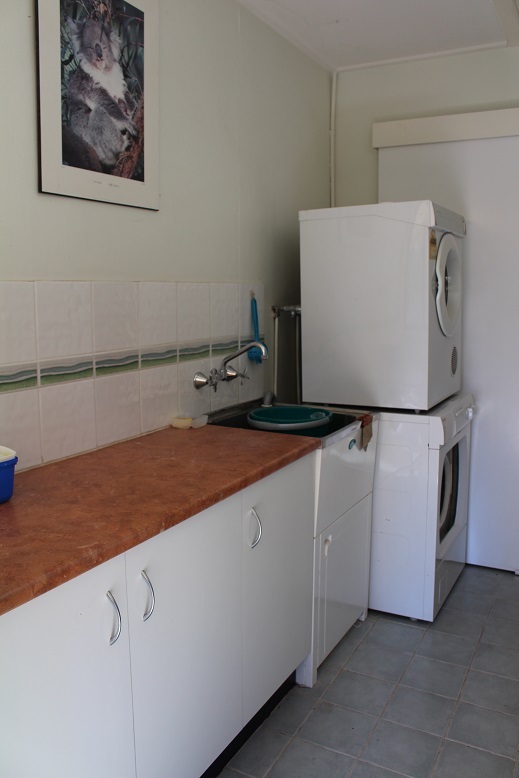 The other is a tall cupboard opposite the washing machine. This is what the cupboard under the bench looked like this morning. Then I pulled everything out. I found that I had a couple of half-used bottles of laundry liquid so I condensed these. I also decided to change the storage container for the dry cat food from a large, round bucket which is never full to a more manageable oblong container. The spare spray bottles which were living in the rectangular bucket have been removed and will be stored downstairs. 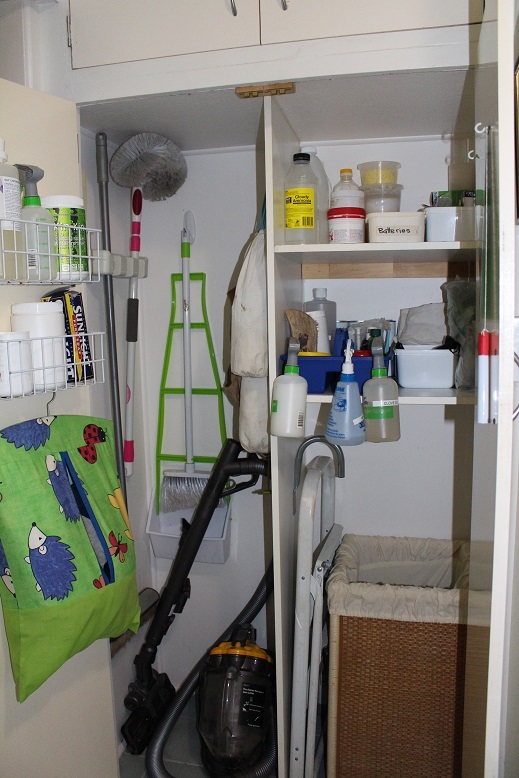 The cupboard, shelves and inside and outside of the doors was wiped down and cleaned. 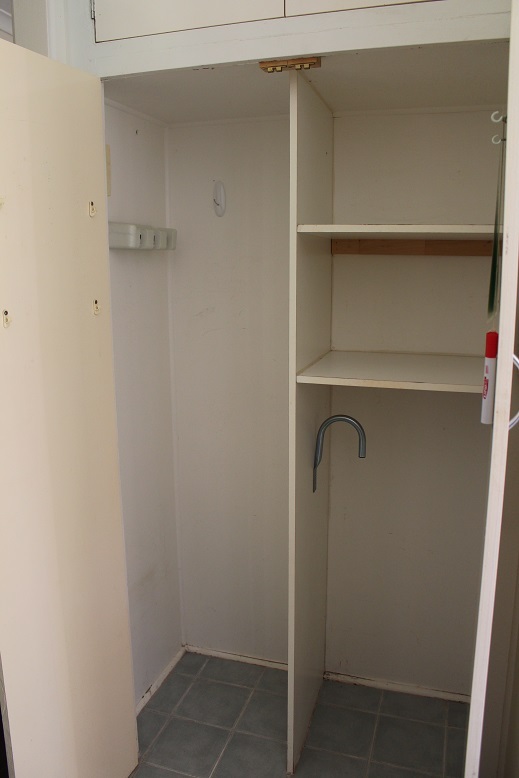 I was astounded at how grubby the insides of the cupboard doors were. The finished cupboard is a bit more organised. Then it was on to the tall cupboard. Here is the before photo. For a moment, I was tempted to just ‘tidy it up’ but decided to remove everything (including the rack on the inside of the door) and do it properly. Everything got the ‘once-over’ before putting it back. I scrubbed the small stepladder, removed and cleaned the liner of the laundry hamper, washed the plastic bag holders and repaired the rag-bag where it was coming unstitched. I realised that I barely scratch the surface of the pile of rags in the bag so I sorted through them and have sent a few downstairs to the workshop and thrown a few in the rubbish as the fabric was not terribly good for any sort of cleaning job. 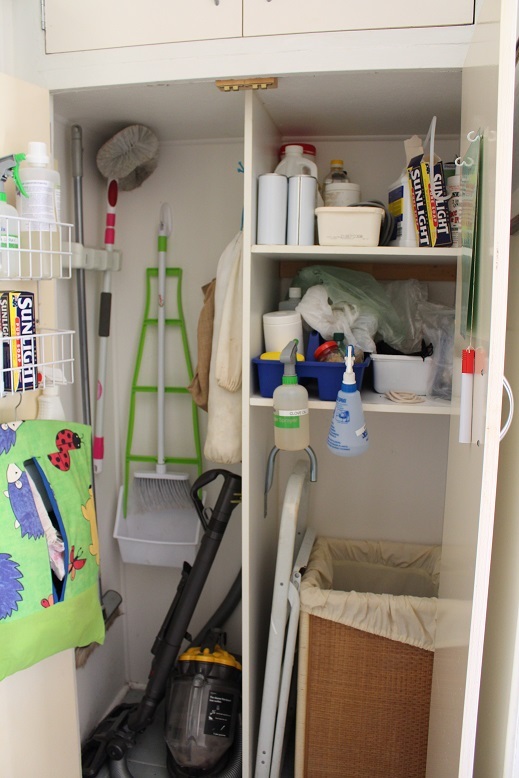 I checked what cleaning supplies I had and made sure that they were all things that I will use – either currently or in the future – before putting them back. 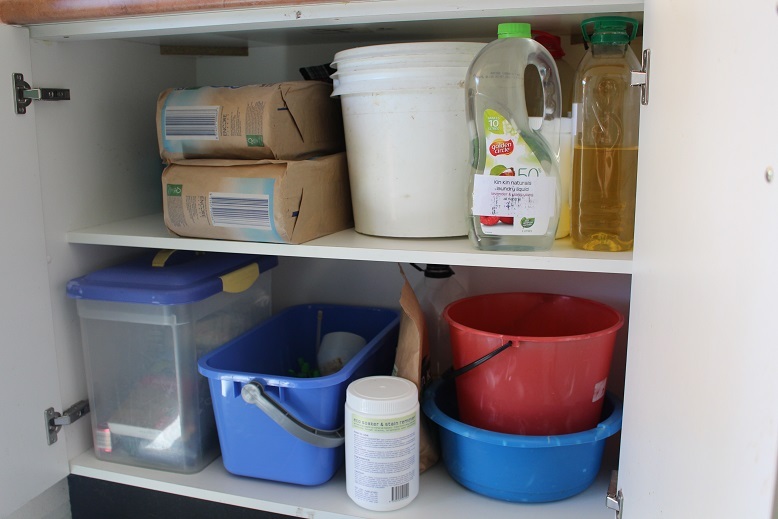 Like every other area of the house, I have been working on reducing the amount of ‘stuff’ that is in here by using it up and in some instances not replacing it. Once I had refilled the rag-bag and plastic bag holders it was time to put everything back in its place. 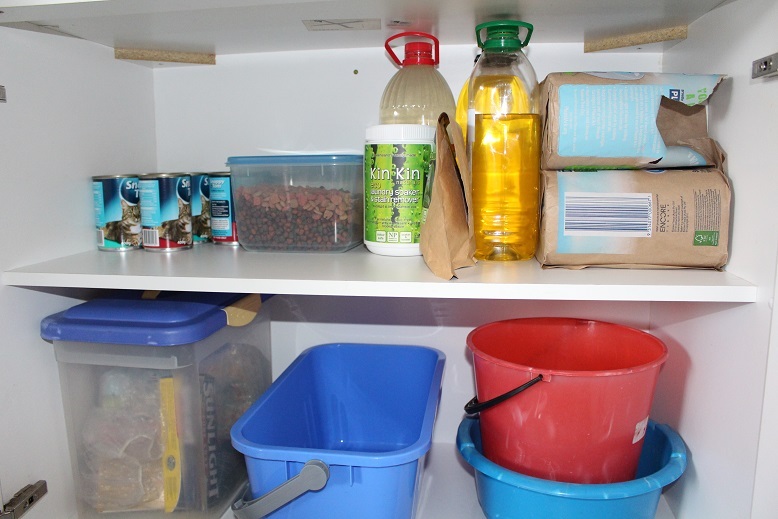 Whilst the overall view is not substantially different, I am happy that I know what is in the cupboard and exactly how much I have.